I found my old zip disk drive yesterday when I was cleaning up for my party (tons of fun- it was a great time), so this morning, after cleaning up all the glasses in my living room, I plugged it in & pulled out some zip disks that I still have. 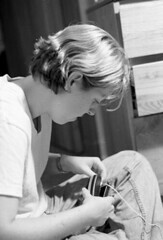 I found a few scans of images that I took in college, including this one, of me doing some 3-D design homework. Notice that I'm using a stapler and string to do my homework. Very artsy fartsy of me. Geeking with Greg: Early Amazon: Door desks: "In addition to being inexpensive, door desks offered a lot of surface area. Put your computer monitor on top and in barely makes a dent. If Amazon wasn't so bloody cheap, you could have put three more monitors up there. Plenty of space for all of your crap.Ergonomically, door desks leave a lot to be desired. Keyboards were usually too high. Typing for hours could be uncomfortable. And those angle brackets have sharp edges; accidentally scrapping exposed flesh against those was a mistake that wouldn't be repeated.But door desks came to symbolize the Amazon frugal culture. They took on a live of their own. Years later, in 2001, there was a 6.8 magnitude earthquake here in Seattle. We were in a different building by then -- the attractive PacMed building up on Beacon Hill above downtown Seattle -- but we still had our door desks. And I can't tell you how happy we were to have that door desk over our heads as the building shuttered and swayed around us." Door desks are great. I love mine, it's more than 5 feet long, and insanely deep. Add a keyboard tray, and it's perfect. I have three computers on it, all my O'Reilly books, a coffeemaker, and there's still room to pile up papers and notebooks. I really enjoyed reading his old amazon memories, so here's one of mine... I was hired in Dec 1998, but I still had a semester of college to finish up. So come May 1999, I began to think about my waiting job in Seattle. I sent my manager-to-be an email, telling him I was going to go out to Seattle for a week in May, to apartment hunt, and asking if I could stop by and say hello. He invited me to come by and meet everyone while I was there. So I flew to Seattle, carrying a small thermos with water which held my fish, Puck. My friend- who worked at Microsoft- was going to watch Puck for me for my last few weeks before I moved out. I stayed with her up in Greenlake while I searched Belltown for a cheap apartment. (There were more of those then than there are now.) One day, I walked down to the Columbia Building and met my new teammates. I saw the Bat Cave, where most of the web devs sat. Everyone was using Emacs. I think Bosco showed me how to goof around with the desktops of people who had done "xhost +" by opening crazy windows on their screens. Then I went up and saw Pacmed, where we would soon be moving. And finally, I was invited out to a big lunch with lots of web dev folks, at what is now Dragonfish. That was a great lunch- I tried frantically to remember everyone's name and ingest all the moving-to-Seattle advice I got. Two days later, I flew back to Boston and graduated. Then I flew back to Seattle, and settled into the apartment I'd found. My plan was to take 3 weeks to unpack and hang out before starting work. But quickly, I was bored doing nothing- I'd unpacked my boxes, I'd seen Star Wars Episode One at the Cinerama twice, and I didn't know what to do with myself. I asked my manager if I could start a little early. That Monday, I took a bus up to Pacmed to my first day as an official web geek. That was June 21, 1999. We used to have paper badges, so my first day I got a little blue laminated piece of paper with my login on it. I set up my computer, and settled my fish onto my desk. The next day- my first real day of work- an email went out to all the developers. We were about to launch the toy store, and the photographers (who shot images of all the toys that would be on the site) had an emergency! Turns out, all the legos we had to photograph were in boxes. Photographs of boxes of legos are BORING, and so a plea was sent to the geeks of the company. Come assemble legos, and we'll feed you pizza! So my manager and I showed up, ate pizza, and assembled legos. We got our asses kicked by the 6 year old son of one of the PMs, who could assemble lego kits with lightening speed. The part that killed me was that the toy store was a big secret, so I couldn't tell any of my friends that I had the greatest job ever, programming and putting together legos! After the store launched a few weeks later, I was able to pull up some toys detail pages & show off my creations. I just stumbled over this, Wellesley Art Professor Asks, What Do Your Snapshots Say About Your Family? an interview with my college photography professor, Judy Black. I thought it was fitting, since I'm spending my evening working on the photos of Ana and Kate that I just took last week. "Photographs look so honest and truthful," she said. "But it all depends: All photos have the problem of interpretation. It's the person taking the picture who's doing the editing, not the camera. If you were writing in a journal or painting a portrait, you would be much more aware of the editing." My new niece, Ana, with her mom. Ana is amazingly tiny- and I thought that Kate was small when she was born! My (6.5 year old) vacuum cleaner died tonight. I spilled coffee grinds all over my kitchen and my entryway this evening, and the vacuum cleaner, despite going over and over and over and over them simply isn't picking them up. So, fire up web browser, run an all products search for vacuum cleaner and... see above. I wish that amazon would remember more often that a store is only as good as its product data. Last night, I fell in love with Ride's From Time To Time. How do you put a song like this into words? I didn't pay much attention to it for the first 1:20 when it started playing on my ipod. It starts off nicely, but nothing to blow you away. Then the vocals started, so melodious that it made me look up from the book that I was reading and hit the back button to start the song over again. Then sitting for another 1:20, listening closer. "On a perfect day....I know that angels come from time to time...." An endless loop of swirly guitar. Sublime. Allmusic.com calls it a Vapour Trail, part II, but right now, I love the sweet hooks in this song a million times more. Vapour Trail, for me, never breaks out of its pretty shell, stays too distant. From Time to Time feels more intimate, closer and open. Falling into the opening chords now, looping over and over, it's so gorgeous. The shock of a song that I must have heard hundreds of times reaching up and biting into my consciousness is easily the biggest reason why I love music. I was reading a moment before; not paying any real attention to what I was listening to. Maybe that inattention was what it needed to push itself up so that I would finally hear it. I know I've played it, sung along to it, before- OX_4 has for months been on high rotation on my car's CD player- but I never actually noticed this one song in the mess of great shoegazing on that album. Getting called to attention by a hook that I'd never expected, falling in love with a new bit of song, happens so rarely- I can remember almost every individual time it's happened to me, when I've scrambled to turn up a volume knob, jammed in earbuds tighter so I can hear what just slipped past in a moment. While I was in NJ, meeting Annika and shoveling out from Saturday night's snowstorm, Declan was at my friend's home with Bandon. At some point in the weekend, my friend came back from walking the shelties, and stepped out of the elevator into his building's hallway and unleashed both boys. He walked up to his front door, opened it, and went in after Bandon, then shut the door. Leaving Declan out in the hallway. About 10 minutes later, he heard Declan barking in response to Bandon's barking.... from the hallway. He opened the door, and Declan was standing right outside the door. Only my crazy sheltie would spend 10 minutes, standing at a closed door, waiting for the person inside to remember that he was stuck out there. I heard this story on the way back to Belltown from SEA last night- I had to give Declan a big hug for being so dumb (or so super smart?) that he didn't walk off & lose himself in the building. Also, since this is Seattle and a fairly warm January, I just bought a really gorgeous new pair of red sandals! I've liked Chacos leather sandals for a while, and I just got a pair of Chaco Maria's that was on sale. They have super cushy soles, so they'll be great for walking to work this summer. My commute is a 1.9 mile walk- down one hill and then up another, so it's a good workout both directions. I'm always searching for pretty shoes that I can walk that distance in, since I don't so much like to wear sneakers everyday. Can't wait to break these in! I'm packing tonight, to go home & meet my new niece (Kate's little sister), Annika. I keep a lot of clothes in NJ, so my suitcase is going to end up looking a bit weird. In it so far- presents for Kate and Annika (I made sure to pick up some Elmo stickers to bring Kate), a hoodie, two tshirts, socks, my ipod, ipod charger, Palmpilot and charger, cellphone and charger, work laptop, VPN, charger, lots of film, my SLR, a scarf, an apple and some cookies for the flight, and two books to read. I think that puts the electronics to clothes ratio at 2:1, if we count the chargers as their own items. Oh geesh, am I a geek. My packing music tonight is 2001, which has been in my "top 10 albums of all time" since I first heard it. My favorite track on it these days is Still D.R.E., with Xxplosive right behind it. Soincrediblygood. Aha! iTunes has fixed itself, and The Green Green Grass is now downloading. (I wish all bugs were fixed by blogging about them....) Bliss. If I close my eyes when I listen to this album, I'm lying flat on my back, with a pillow on either side of my head. The pillows are next to, instead of under my head, because they are holding bags of frozen peas against my cheeks. 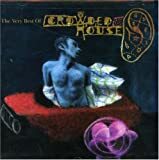 My room is kind of dark, and this album is playing through my powerbook's weak speakers, next to my bed. I don't know how many times the album loops, because I have no memory of what I heard three minutes ago. I remember, in quick flashes, my roommate driving me home from getting my wisdom teeth taken out. I think I might remember coming in the front door. I can sort of make out that besides feeling weirdly unconnected to time, I feel fine. I'm just lying there, listening to this album, which I just bought a few days ago and haven't really listened to yet. So I know it sounds weird to associate an album with getting one's wisdom teeth removed. I just can't break the connection with the songs here. Recurring Dream... I can't really remember why I bought this album. I knew that they had written Don't Dream It's Over. No idea why years after that song was popular I decided to buy their greatest hits album, or why I put it on that evening. I love the songs on it now, though. The harmony, and just the amazing clarity, are gorgeous. I can't hear the opening chords of Weather With You and not immediately want to listen to the whole album. The beginning is the strongest part, but the fall off at the end is relative, the sweetness, and quiet assuredness, of the ending songs are still steps above most other music I've heard. The Shadowland/Lightroom Development Story - Lightroom is Adobe's answer to Aperture. Very interesting article, with lots of photos inline. I need to shoot more black and white film. I think that the last photos that I took in black & white were sometime in April or so. 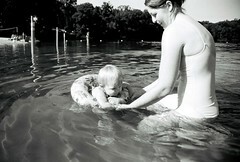 There are two things that will, in my mind, forever look better in black and white than in color- water and skin tones. So here are two of my favorite black and white photos which I hunted out & uploaded to flickr. Arun and I were talking today about how all of a sudden a couple of us upgraded to flickr pro. They do a great job of getting you addicted to uploading photos to it & looking at pictures there. It's completely usable for free, until you've gotten addicted enough that you want to upload more photos... sneaky sneaky. What a great business plan. Since I gave in and upgraded, I've been uploading a ton of photos to the site. I figure that I might as well get the full use of my $25, and it's fun to see all the comments that people add. In fact, if I could find the cable to my digital camera, I'd upload some hilarious photos of Declan and Bandon. They've been driving me completely nuts, but some of the pictures of their antics are pretty goofy. 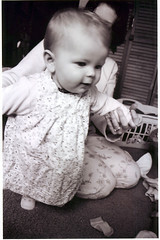 I love the amazing sense of movement in this picture of Kate learning how to walk. It was so dim in her bedroom (where I took this picture) that I was afraid that I wouldn't capture anything- if I remember, I was only using 200 speed film or something horribly unsuited to taking photos of babies indoors. It worked out well, though, because the small depth of field blurred everything together and made the light- which was just from a lamp or two- come out so diffuse and nice. And all the laundry in the background is great- not only do the socks and whatever on the rug make a nice bouncy border along the right side, but it pushes the picture miles away from being overly posed portraits. Those drive me nuts. Stiffness in photography is one of the worst things to me. I worry way less about screwy contrast or flat light than I do about really finding a moment.